Blog | Blogs on our website were written by Chinese or Americans who are very familiar with the Chinese culture. They gave you insights into the Chinese world, such as relationships, hospitality, holidays, and as well as their spirituality. Spiritual Life of Chinese Students in U.S.Study by Purdue University | This research report gives you a glimpse of the spiritual background of Chinese students on U.S. campuses and their attitudes towards Christianity. 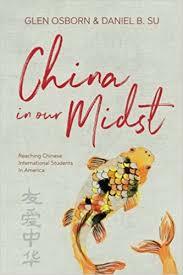 Glen Osborn & Daniel B. Su, China In Our Midst | This book combines research and rich personal stories to give you insights, tips and encouragements to engage Chinese students, to understand where they come from, and to journey with them spiritually. Video: Channel C | Channel C is a video series started by three Chinese international students at UW-Madision. What started as an effort to encourage better integration of Chinese students on campus has blossomed into a YouTube channel. It has humorous and yet insightful videos on life of Chinese students on campus, covering diverse topics such as cultural differences, Chinese names, academic and dating life. These videos will help you better understand the culture and the struggles of your Chinese friends on campus. Video: The Three Teachings | The Three Teachings Taoism, Buddhism and Confucianism have been a backbone of Chinese society and culture since the bronze age. The Three teachings are still intertwined strongly with today’s China. This video gives you a brief introduction of what each teaching is and how it has shaped Chinese culture. Video: Is China an Atheist Country? | You often hear Chinese students say that they are atheists. What does that mean in Chinese context? What are the spiritual backgrounds of Chinese students? This video will give you some insights.